When something goes wrong, we are told that the way to prevent further crisis is better technology, more laws, and bigger bureaucracy. How to protect ourselves from the next financial crisis? Stricter regulations, more and better advisers. How to protect ourselves from the threat of terrorism? Homeland security, full body scanners, further sacrifice of individual freedom. How to counteract exploding costs in health care? Tax hikes, rationalization, better genetic markers. One idea is absent from these lists: risk-savvy citizens. In this wonderful book, Gigerenzer shows how to assess and deal with risk (i.e., known risks) versus uncertainty (i.e., unknown risks). 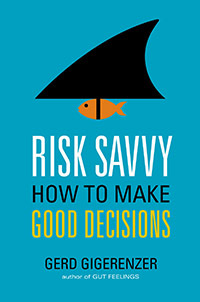 “If risks are known, good decisions require logic and statistical thinking…If some risks are unknown, good decisions also require intuition and smart rules of thumb.” He provides practical guidelines for applying the right types of thinking to many real problems that we face in life, such as those related to finance and health care, leading to better decisions. He exposes the folly of trusting statistical algorithms when they’re applied to high levels of uncertainty, such as the behavior of the stock market. He also proposes ways to simplify the understanding of probabilities associated with quantifiable risks, such as the risk of dying from prostate cancer if you test positive on a prostate-specific antigens (PSA) test, which many medical doctors misunderstand. He cares deeply about health care and is intimately acquainted with its failures in decision making. The major cause is the unbelievable failure of medical schools to provide efficient training in risk literacy. Medical progress has become associated with better technologies, not with better doctors who understand these technologies. Medical students have to memorize tons of facts about common and rare diseases. What they rarely learn is statistical thinking and critical evaluation of scientific articles in their own field. Learning is geared toward performance in the final exam, which shows little correlation with clinical experience. Everyone can learn to deal with risk literacy. In this book, I will explain principles that are easily understood by everyone who dares to know. Experts are part of the problem rather than the solution. Many experts themselves struggle with understanding risks, lack skills in communicating them, and pursue interests not aligned with yours. Giant banks go bust for exactly these reasons. Little is gained when risk-illiterate authorities are placed in charge of guiding the public. Less is more. When we face a complex problem, we look for a complex solution. And when it doesn’t work, we seek an even more complex one. In an uncertain world, that’s a big error. Complex problems do not always require complex solutions. Overly complicated systems, from financial derivatives to tax systems, are difficult to comprehend, easy to exploit, and possibly dangerous. And they do not increase the trust of the people. Simple rules, in contrast, can make us smart and create a safer world. His arguments are convincing and the principles that he teaches are practical and accessible. I recommend this book.